P. Joseph McKee, III, P.E. is the CEO of PARIC. He guides all aspects of operations with an emphasis on corporate strategy, customer relations and business development. He makes it a priority to ensure that PARIC clients Experience. Excellence. at every point. Joe earned his BS degree in Structural and Environmental Engineering at Vanderbilt University and his MBA at Washington University in St. Louis. He has been recognized by the St. Louis Business Journal with the “40 Under 40” award and has received the “Outstanding Professional Engineer in Construction” award from the St. Louis Chapter of the Missouri Society of Professional Engineers. Joe has also been acknowledged as a “Top Most Influential” by the St. Louis Business Journal. 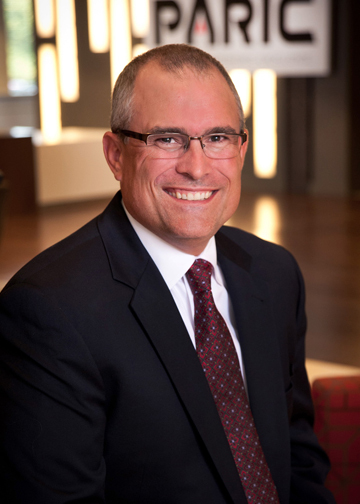 Joe’s community support includes serving on the Young Presidents’ Organization (GOLD) - St. Louis for over 11 years, the Regional Business Council, St. Louis Children’s Hospital Foundation, and Visitation Academy. He also has been a partner of the Stifel Theatre for over 5 years. In addition to Joe’s leadership role within PARIC, he also is extremely involved with the National Multiple Sclerosis Society and Our Lady of the Pillar Church.